Fortune Street is simply too complex. As a result, it becomes rather dull quickly and is certainly not the party game it's marketed as being. Stocks, dividends, profit margins and pay raises – those are terms you’ll quickly become familiar with while playing Fortune Street. The game thrives on monetary management techniques and investment strategy, presenting its rather grown-up premise in board game form. Parents who eagerly state that video games never teach us anything, will certainly be wrong about this one. The problem is that this formulaic, micro-managing game suffers from an identity crisis – lacking knowledge of just who it should be marketed towards. In truth, it’s probably a bit too much of a niche title for most. 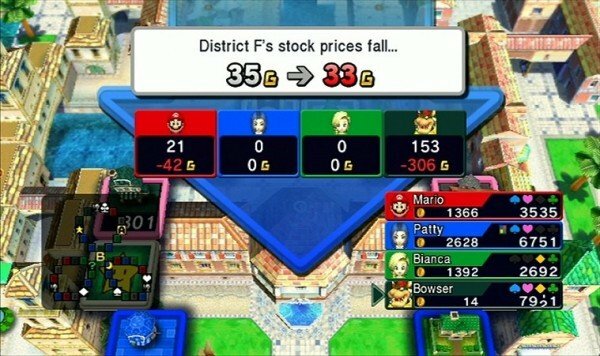 In Fortune Street, gamers can challenge their friends to board game competitions with a heavy emphasis on gross wealth, as opposed to mini-game supremacy. The end goal is to be the first one to earn a certain amount of money, whether it’s six, thirteen or eighteen thousand dollars. Then, you must make it to the bank in order to confirm your supremacy. Getting to that point is accomplished by turning your Mii into a ruthless businessman, in an attempt to weasel money out of your competitors’ wallets. If you want to be the character who makes it onto the top of the podium at the end, then it’s important to buy low and sell high. However, the most vital thing to remember is to always give your next move a great amount of thought. One poor decision can create an economic downfall, quickly dropping your number one status to a fourth place duldrum. Once the game loads, a choice is presented. Players are asked to pick one of two available rule sets: beginner or traditional. The latter is the full rule set, which has been with this series since the very early 1990s. You see; Fortune Street may be new to the West, but it’s part of a series which has been around for two decades. Since the days of the Nintendo Famicom (the original Nintendo Entertainment System to us), Japanese gamers have attempted to become money-managing wizards within various iterations of the Itadaki Street series. This specific release focuses on two completely different franchises: Super Mario Bros. and Dragon Quest. As a result, its character roster and boards are all derived from designs found in each popular series. Examples include Mario, Diddy Kong, Princessa, Bianca and Slime. In this version of Capitalism 101, each character must roll a die to determine his or her move count. Occasionally, a directional choice will be presented, giving them a chance to decide which part of the board to walk along. Regardless of which one is chosen, the task remains the same: quickly pick-up all four suits (heart, diamond, spade and club) and get back to the bank with them for a pay raise. That would be the absolute end goal for every trip around the board, but there’s a lot more to it than that. Your pathway is littered with money-making opportunities and, conversely, ways to lose your fortune. Spaces are predominantly held by for sale businesses, which can then be upgraded to a certain point. Once the potential profit gap is breached, then the store is at its peak. Every board is broken up into several different regions, comprised of around five or six spaces each. Lettered individually, they form easy-to-understand areas, ripe with stock potential. Like in real life, prices fluctuate based on the area’s profitability, as well as the amount of stocks sold. It makes sense to make the purchase when they’re low, in an attempt to get them to a high price point before selling. However, doing that quickly would mean skipping an integral action. In order to actually profit well from the monetary slips, one should own and upgrade a few different stores within that area. An attempt to monopolize can be made, but opponents will usually own one or two of the properties you need. Luckily, swap proposals can be set-up, with monetary gifts added to sweeten the deal. Throughout each game, characters are in possession of two different types of cash. One is essentially pocket money, which is used to make small purchases, while the other is your gross wealth. The latter bank account is what you’ll need to get to a certain plateau. However, that’s easier said than done, considering some purchases will use that balance instead of your everyday cash. Buying out an opponent’s business for five times its value is an example of one of those occurrences. Plus, the lump sum will take hits during dividend payouts. Additional, random negative mini-game and chance card results, can also be detrimental to your accumulated lump sum. 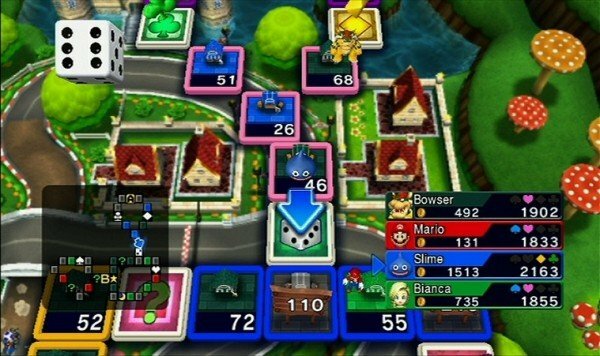 When mini-games are mentioned in relation to this type of four-player board game experience, it’s hard not to think of Mario Party – Nintendo‘s long-serving and successful party franchise. However, Fortune Street plays quite differently from that well-known series, focusing more on business management than mini-game success. Competitive challenges aren’t a fixation here, with the term being used to describe short games that play out when a player lands on a certain marked spot. Once the space is activated, it will predominantly bring up one of a small amount of relatively uninteresting games, including a dart throwing challenge, a memory block chance game and a block-based slot machine. Though, there is one half-decent blob race betting challenge. 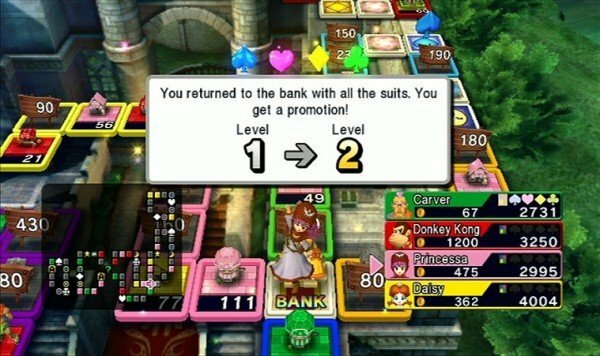 Beneficial rewards can be earned, such as a free suit card, or extra coins. However, the negative Bowser icon also factors in, reserving the chance to take wealth from unsuspecting avatars. In addition to the aforementioned mini-game space, several other unique spaces dot the board. For example, if a player lands on one of the suit spaces, then he or she will get a chance to pick a card. Adding risk and chance to the proceedings, those cards can either be beneficial or detrimental to your cause. One may give you a certain amount of coins or a free promotion, while another may lower property values or give an opponent a free gift. These are the most prevalent unique locations, though a couple others can be found. They bring with them benefits such as commission on every player’s financial acquisitions for one turn, or the chance to buy stocks instead of having to wait until a specified time. Conversely, the one spot to look out for is the snooze spot, which closes a player’s shops for one turn. Using these rules, Fortune Street is a very complex game. One that is perhaps too intricate for its own good, making the game more of a math lesson than a fun party game. Sure, it’s a good way to learn about stock and dividends but, when it comes down to it, this is a game which is supposed to be fun. Unfortunately, this one doesn’t deliver as much as it needs to in that department, becoming rather dull quickly. A lot of it has to do with the lack of creative mini-games, interesting spots and varied game play. Considering that each individual game can last for quite a while (longer than an hour, easily,) it means that you’re doing the same thing over and over again for quite a while. This will only interest a niche group of gamers, as opposed to the Wii’s wide target margin. As a result, it’s hard to recommend this game to anyone except for financial gurus and middle-aged gamers, who are looking for something intelligently involved to play with their friends. If each round was shorter, then the game would be easier to digest with its myriad of intricacies. As you progress, the originally confusing minutia becomes easier to understand, but there are too many ways to easily drop out of the running when you’ve been in first for a while. Length factors in here, as you can spend so much time succeeding, just to lose it all in the last portion of the round. Preventing players from being able to change the target margins in the single player challenge circuit (made up of three individual sets of five lengthy matches, which get progressively challenging as you move forward,) is certainly a detractor. At least a customizable free-play option is present. Those who choose to play using the basic beginner settings, will be privy to lower wealth goals and a dumbed down set of rules. Stocks and dividends are eliminated, making promotions and savvy business ownership the keys to success. You can expect shorter games, but they’re still pretty long. However, regardless of which rule set is chosen, the game will still take up a large chunk of time. At least this version is more accessible for the younger crowd – a market which this game is incorrectly marketed towards. Its visual assets, colour palette and cover art, all scream party game. However, the experience is more of an in-depth and very statistical Monopoly, as opposed to a Mario Party style game. Playing with default speed settings will establish a very slow-paced game experience. Competitors’ moves will take a long while to complete, much like your own thought-provoking opportunities. Both have quite a bit of text which moves slowly at all speeds. For this reason, it’s important to go into the menu to speed things up before playing. Otherwise, you’ll be waiting quite a while for your next turn. That length adds onto the round’s final time, which is lengthy either way, considering how long it takes to accumulate large amounts of money within this game. Occasional promotions gift players with hundreds of dollars for the first four or so, eventually improving to a thousand dollar raise and so on. If you’re going for $13,000, then it’ll take a ton of turns to get there, unless a character goes bankrupt. That’s another way to end things. Online play is also available, for those who would like to jump online against real-life opponents. Along with local multiplayer, that option will provide fans with an optimal Fortune Street experience. Playing against the computer in single player can become frustrating, as they quite often perform incredibly intelligent moves. Even low-ranked competitors can be quite a challenge as a result, making the championship circuit mode a hefty task to tackle. As you progress from one board to the next, the other characters’ ranks improve. Starting off, C and D ranks will be common, improving to A and S later on. If the aforementioned descriptors sound interesting to you, then Fortune Street is worth checking out. Though, keep in mind that it’s certainly not for everyone – especially younger kids who would have a lot more fun with any game in the Mario Party library. While it’s certainly for some folks, this game wasn’t something that I had a lot of fun playing. 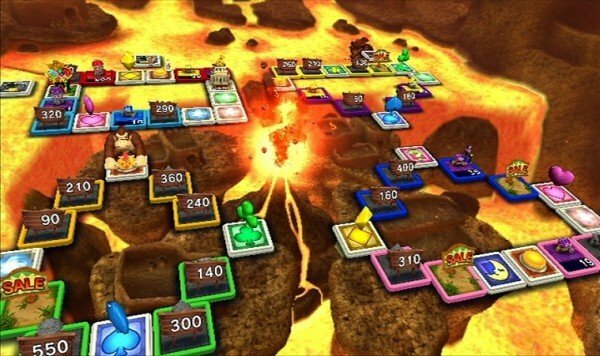 Square Enix deserves commendation for managing to turn math into an decent board game principle, but the result is a game which is, for the most part, more complex than entertaining. The included game play happens to be far too formulaic and repetitive, lacking enough interesting variety to keep a lot of gamers interested in completing lengthy game sessions when there are more exciting titles out there. As much as I wanted to enjoy this game, going in with an open mind and a hopeful spirit, it ended up being an underwhelming experience. Most of the game’s visual variety comes from the landscapes underneath each board. In an odd design choice, each one of the Dragon Quest and Super Mario Bros. themed boards is set-up in the clouds, well above land. Sure, it’s nice that the environments below are animated and relatively interesting, but it’s a disappointment that they’re not taken full advantage of. Also, making the boards more unique than they are, would have been a beneficial move. The development team could have created more variety by making each one play in a noticeably different manner, instead of focusing predominantly on changing up the grid’s shape. Other than those designs, there isn’t a lot to look at, other than some decent character models and the odd mini-game background. Overall, the supplied visuals look all right, with some decent detail, but they’re still nothing to write home about. Where its soundtrack excels is in its ability to provide fans of both series with memorable tunes from their storied histories. The familiar chimes and tunes are there, but their accompanying original content won’t win any awards. You also won’t remember it for a long time to come. It does work and ends up doing the job, which is what’s important. Then again, this type of a game doesn’t need the best music ever created. 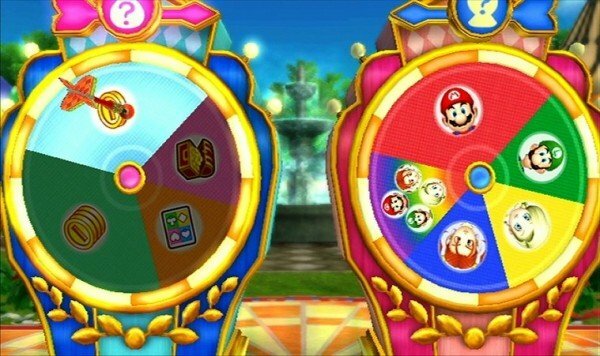 In the end, Fortune Street is a game you’ll either like or dislike. It’s a very involved mathematical game, which certainly won’t appeal to a younger crowd, or casual gamers who happen to be looking for something to play in short bursts. Even playing one round will take quite a bit of time, and a lot of thought. The final result is a niche title that will only be appreciated by a select group of digital entertainment lovers – a result of being too complex and involved for most. Going in, my mind was open, with the hope that this disc would provide me with hours of extremely entertaining content. However, it didn’t excite me at all. The included complexities are interesting and provide something different, but the game play itself isn’t as fun as it could’ve been. Added variety could have helped for sure, plus shorter game times. What’s there isn’t bad by any means, but it ends up being rather average and underwhelming overall. This review is based on a Nintendo Wii copy of the game that we received for review purposes.